At Bitvore, we see a lot of news about electronic cigarettes (or e-cigs for short). Opinions about the nicotine delivery devices run the gamut: some see them as a way to reduce the incidence of cancer and emphysema, while others view them as a dangerous new way to consume an addictive drug that is likely to have serious side effects. For municipal bondholders, the impact of e-cigs also vary. To the extent that smokers switch to e-cigs, tobacco sales decrease, triggering lower payments by cigarette companies to states under the 1998 tobacco master settlement agreement. Several states accelerated the revenue impact of these settlements by issuing revenue bonds secured by future proceeds. If these future proceeds decline more rapidly than expected, holders of tobacco settlement bonds could face defaults. E-cigs are also bad for general obligation bondholders, especially in states and cities that tax cigarettes heavily. If tobacco taxes are a major revenue source and smokers switch to e-cigs, less general revenue will be available to pay bondholders and attend to other spending priorities. One way that state and local governments can deal with the revenue impact of smokers switching to e-cigs is to tax these alternative nicotine delivery devices. 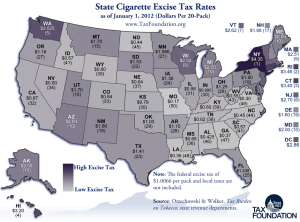 Indeed, if smokers switch to e-cigs rather than drop nicotine consumption altogether and if e-cig and tobacco taxes are similar, the increased popularity of e-cigs could actually be revenue positive for a state or city. As Bitvore users learned recently, the idea of taxing e-cigs is getting attention in Arizona – a state that is facing a $1 billion budget deficit in 2017. While interest in an e-cig tax is building in the state legislature, there is extensive opposition to taxing the vaping devices to the same degree as cigarettes, which carry about $2 in extra taxes per pack. Over the next several years, we are likely to see a wide variety of state and local government approaches to e-cigs: ranging from bans, to tolerance with additional taxes, to complete laissez faire. Debate over e-cig policy in the cities and states whose bonds are in your portfolio will continue to be covered in local media reports. And you will be able to find this coverage, mapped to the CUSIPs in your portfolio, on Bitvore.